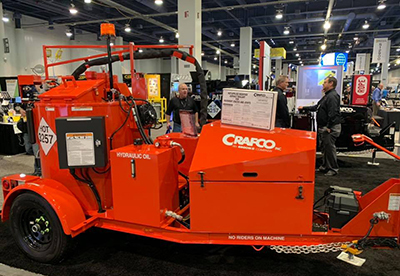 Crafco will host its annual booth at World of Asphalt, February 12-14, 2019, at the Indiana Convention Center in Indianapolis. The premier trade show for the aggregate, asphalt, pavement maintenance, and traffic safety sectors, it anticipates more than 6,000 participants and 450 vendors. Crafco will offer a number of pavement preservation, repair, and maintenance solutions this year. In materials, this includes its hot-applied small crack sealants and Mastic One® wide-crack sealant, as well as HP Asphalt Cold Patch™. Equipment will comprise the Crafco Super Shot 125 melter, Patcher II mastic applicator, and Model 30 Dust-Control Router. All units are equipped with environmental and safety features that benefit operators. Territory Managers will be available for consultations on crack sealing programs, material and equipment use, and late-breaking equipment enhancements. The team will also be discussing its newly launched Producer Partner Program that helps asphalt companies gain a new revenue stream by manufacturing and selling Crafco HP Asphalt. Of special interest, Crafco will host a key educational session. Tom Kelly, VP/National Sales Manager, will present “Best Practices for Crack Treatments” on February 14, from 9:30-11:00a.m. at Location 237-239. Attendees will gain insights on routing, cleaning, and sealing that they can implement to improve their cost-efficiencies and performance of other surface treatments. Crafco is the world’s leading manufacturer in quantity and diversity of packaged pavement preservation products for asphalt and concrete such as hot-applied crack sealants, silicone joint sealants, hot-applied mastics, and cold-mix for pavement surface patching and repair. Crafco is the only company to manufacture these types of products and the equipment to apply them.